Co. Antrim: Antrim (3), Ballyclare (2), Ballylinny, Ballynadrentagh, Ballyrobin, Cargin, Connor, Craigarogan, Cranfield, Crumlin, Donegore (2), Dundesert, Kilbride, Randalstown (2), Rashee, Seacash, Sharvogue, Shilvodan, Templepatrick. The Board also included 8 ex-officio Guardians, making a total of 32. The population falling within the union at the 1831 census had been 47,058 — ranging from Ballynadrentagh (population 1,514) to Antrim itself (6,060). The new workhouse, built in 1842-3, was designed by George Wilkinson. It occupied a six acre site and could accommodate 700 inmates. The cost of the building was £5,580 plus £1,474 for fixtures and fittings etc. It was declared fit for the admission of paupers on 4th September 1843 and admitted its first inmates a fortnight later on the 19th September. The workhouse location and layout are shown on the 1950s map below by which time the site had become Massereene Hospital. The workhouse followed one of Wilkinson's standard designs. An entrance and administrative block at the east contained a porter's room and waiting room at the centre with the Guardians' board room on the first floor above. Antrim entrance block from the north-west, 2003. The main accommodation block had the Master's quarters at the centre, with male and female wings to each side. At the rear, a range of single-storey utility rooms such as bakehouse and washhouse connected through to the infirmary and idiots' wards via a central spine containing the chapel and dining-hall. A separate fever hospital was later erected at the east of the workhouse with a burial ground to its rear. 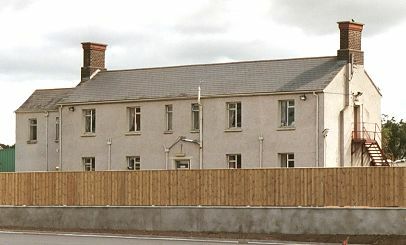 Antrim fever hospital from the west, 2003. 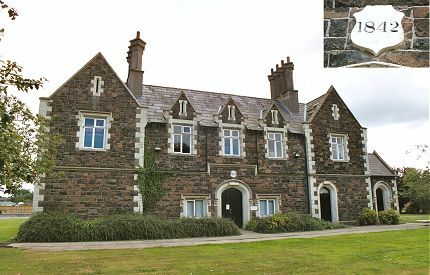 In 1917, the workhouse was closed and Antrim paupers needing indoor relief were thereafter boarded out at the Ballymena workhouse. In 1921, the workhouse premises were converted to became Massereene District Hospital, now closed. The site was cleared for development in 2003 but the entrance block survives and is used as offices by local social services. The fever hospital also still exists. Public Record Office of Northern Ireland, 2 Titanic Boulevard, Titanic Quarter, Belfast BT3 9HQ. Holdings include: Guardians' minute books (1844-1948); Dispensary minute books (1852-99); Workhouse registers (1902-48); Admissions and discharges (1843-1899, 1907, 1941-48); Indoor relief lists (1943-8); Return of deaths (1905-48); Outward letter books (1904-48); In letters (1907-4); etc. Gould, MH (1983) The Workhouses of Ulster .